This map indicates that Dunkin' Brands is developing other Western states before it comes to Idaho. I know a lot of BizMojo Idaho readers salivate at the thought, so it is my great pleasure to report that a franchisee has opened Utah's first Dunkin' Donuts store and plans to open 15 more. I was in Salt Lake on Sunday and saw the place, at 200 E. 400 South, with my own eyes. I resisted the temptation to buy a dozen donuts for the road. I had already eaten two servings of cobbler at a picnic, so my appetite was in remission. The franchisee for the Salt Lake store at 200 E. 400 South is Sizzling Platter, a Utah-based restaurant management company. Sizzling Platter operates Dunkin' Donuts locations in Texas and manages restaurant locations across seven western states. Besides Dunkin' Donuts, they are involved with the Little Caesars, Sizzler, Red Robin and Hoppers Grill & Brewery brand. It operates Sizzler in Idaho Falls and was the operator of the Ruby River, which closed in 2009. 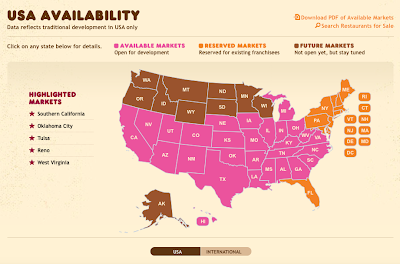 While Dunkin' Brands (also the owner of Baskin-Robbins) has been expanding aggressively in Asia, the Western United States have been a void. In fact, the company pulled out of California in the late 1990s and acknowledges that it faces some challenges regaining market share there. Here's a link to a story that ran in April in Bloomberg Business Week: http://www.businessweek.com/articles/2013-04-11/america-dunkin-donuts-next-frontier And here's a quote from the article that ought to bring joy to anyone who occasionally longs to have the front of his shirt covered with powdered sugar: Expanding west means California, as well as the 12 states back home still sans Dunkin' Donuts: Alaska, Hawaii, Idaho, Minnesota, Montana, Nebraska, North Dakota, Oregon, South Dakota, Utah, Washington, and Wyoming. By 2015, about two-thirds of the chain’s new U.S. stores will be in the western part of the country.